Mr. Whitbeck’s resolve is daunting. Nice to know that a meeting of Republicans doesn’t always run like a Swiss watch. Despite some false rumors to the contrary, I have only ever been in the audience of an LCRC meeting once. That was in mid-2012. The contrast with LCDC meetings was striking. Local electeds presided (after the chair introduced them). Sup. Delgaudio gave the benediction. No time was given to committee reports or other adminstrivia. One member received an award for Volunteer of the Month. A clipboard got passed around, so people could sign up for a day off from work to do phone-banking for Romney/Ryan. While I didn’t sign it, I passed it along from the person on my left to the person on my right. Since I’m pretty sure everyone knew who I was, i don’t think I’m violating any confidences when I reveal that the clipboard had an impressively long list of names on it. 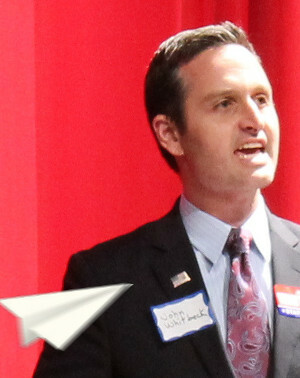 Loudoun Republicans are dedicated foot-soldiers to their cause. Interestingly, it was at that meeting that this blog (still a year away from becoming a whimsical notion in anyone’s mind) got its name: Sup. Volpe declared our region to be the “firewall” between the liberal enclave of Fairfax, to our east, and the conservative vastness of RoVa (to our mostly everywhere else). I have to forgive her (and myself) for overlooking places like Richmond, Norfolk, and Charlottesville; that metaphor was just too good not to use. Oh, my favorite paper flying machine originates in the land of my birth. It is an origami fold, and flies like a dream. Interesting, and thanks for sharing that – well that makes me want to buy a wig and contact lenses and sneak into a Democratic Party meeting to compare experiences. I never had the feeling our meetings were particularly well run …. perhaps I’m too harsh on the party. Never confuse a party with its committee.